The M216 is a unique multipattern stereo tube microphone; it is essentially two of the company’s M16 mics built into one case. Two 25mm large-diaphragm capsules are stacked vertically; the top one can be offset with respect to the bottom by 90%. Both capsules are dual-diaphragm, multipattern designs; the M916 power supply provides twin 9-position pattern selection controls. Telefunken USA calls the capsule design “TK67;” it is a 32mm version of the 34mm Neumann K67 capsule, and like the original is center-terminated. These capsules are believed to be sourced from an overseas supplier. Either capsule could be set to another pattern to tweak the stereo field; e.g., wider or narrower cardioid settings on the “mid” channel of a mid-side arrangement. The power supply also provides a “matrix” mode, in which a second pair of phase-reversed XLR outputs are activated. This produces a quadrasonic output, in that all four diaphragms are sending distinct outputs. 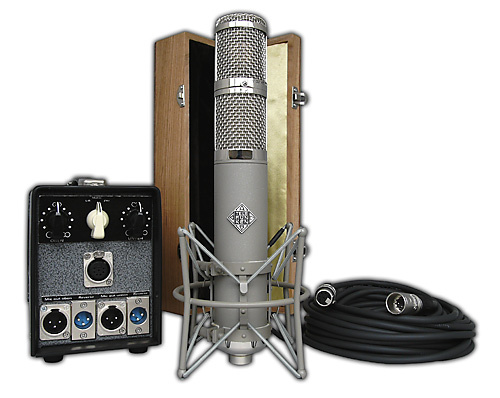 The mic body contains two separate amplifier circuits (one for each capsule), two AMI BV314 output transformers, and a single twin-triode tube that is described simultaneously as a “6072a General Electric JAN” (12AY7) and “New Old Stock ECC81” (12AT7). Each M216 microphone is supplied with a padded wooden storage case, M916 power supply, and a 10-meter Gotham Audio power cable. The mic carries a 5-year limited warranty. The Telefunken Elektroakustik R-F-T M216 Matrix is also known as: Matrix, M-216.